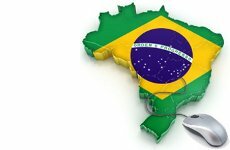 Researchers have been monitoring attacks in which cybercriminals hijack the routers of users in Brazil in an effort to redirect them to malicious websites. The attacks were first investigated by Kaspersky Lab last week. The security firm found emails allegedly containing photos that demonstrate to the recipient that he/she is being cheated on. The link in the messages points to a website containing adult content. The site in question hosts some scripts designed to hack into the administration panels of home routers and change their DNS settings so that victims are redirected to bank phishing websites. In order to gain access to the admin panel, the malicious code tries username/password combinations like "admin/admin," "root/root" or "admin:gvt12345" (default credentials set on routers provided by a major Brazilian ISP). "The scripts will continue trying combinations that point to the control panel of your network device such as [your-router-IP].rebootinfo.cgi or [your-router-IP].dnscfg.cgi?. Each script includes the commands to change the primary and secondary DNS servers. If you're using default credentials in your home router, there won't be an interaction and you'll never realize that the attack has occurred. If you're not using default credentials, then [a] website will pop up a prompt asking you to enter it manually," Kaspersky's Fabio Assolini explained in a blog post. When Kaspersky conducted its analysis, the malicious links had been clicked 3,300 times in just three days. Unsurprisingly, most victims are located in Brazil, but some have also been identified in the United States, China, Canada and Mexico. Researchers believe the victims from other countries are likely Brazilians who live there. On Thursday, Sucuri published its own analysis of the attacks. However, instead of using social engineering to lure users to websites hosting malicious iFrames, the cybercriminals compromised the website of a popular newspaper and set it up to hack routers and change their DNS configurations. "The easiest way to address an issue like [this one] is to move beyond the default user name / password configuration. Odds are many of you unpackage the router, set it up and go about your business. You’re safe, who would want access to your home router? Well, now you know who. Routers are the backbone of the internet, even those that you use in your homes," said Sucuri's Fioravante Souza. In 2011 and 2012, tens of millions of DSL modems were hijacked in Brazil and their DNS configurations were changed to redirect their owners to malicious sites. Unsecure wireless connections are also problematic in Brazil. Just before the World Cup took place in the country earlier this year, researchers from Kaspersky analyzed 5,000 Wi-Fi access points in the city of Sao Paulo. They found that 26% of all networks were completely open and didn't use any encryption. More recently, an independent researcher based in Brazil conducted tests on the wireless connections of 420 companies in 552 locations all over Brazil. He determined that 37% of them had been vulnerable to man-in-the-middle attacks.